Seems a significant keynote passage, so far. There is a plot to this book that several have tried to adumbrate over the years, a special Joycean language that others have tried to nail down with a single word of description, characters that chop and change, themes and threads that also chop and change, all of which elements the critics have tried to plumb (see the book’s Wikipedia if you must)…..But I contest that any attempt to plumb these things will come back to choke you. So I won’t. I just know there is an experience to be had here and I hope by the time I reach the end such an experience will have become the whole of me rather than a part of me that I try to examine from outside. 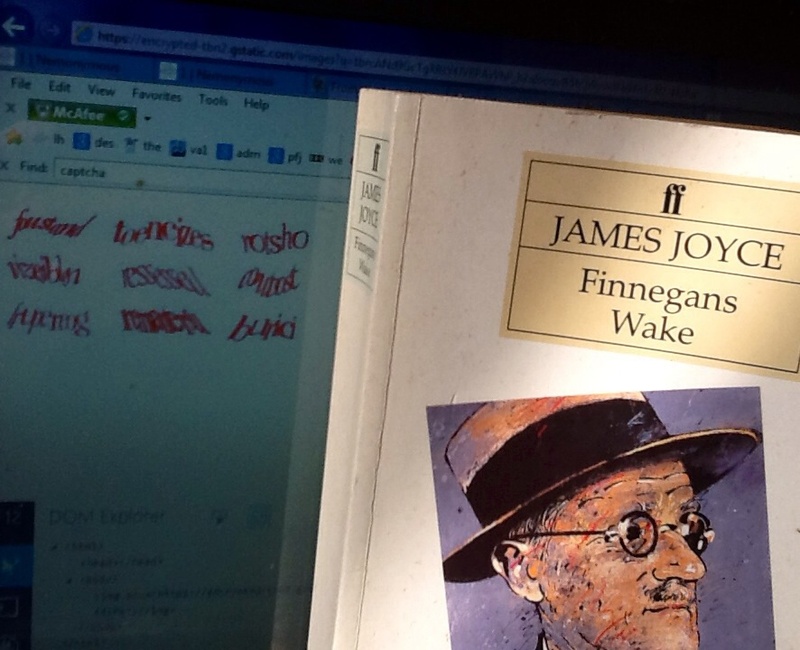 A startling realisation following what I just wrote above – has anyone, other than myself, noticed before that the name Finnegan has ‘finish’ and ‘began’ embedded? Meanwhile, two other authors have come to mind to add to my earlier list of the Finish-Began captives, viz: Elizabeth Bowen and Lawrence Durrell. So far, I see I have instinctively used the terms ‘capture’ and ‘captive ‘ above. In fact, the text reminds me of the ‘captcha’ codes we are often presented with as necessary bot-proof gateways for you being able to ‘manipulate’ sites on the internet. And these codes are real words changed or confused by Joyce (like the characters themselves) into such captcha codes – gateways to what I mentioned earlier regarding the manipulation of death? 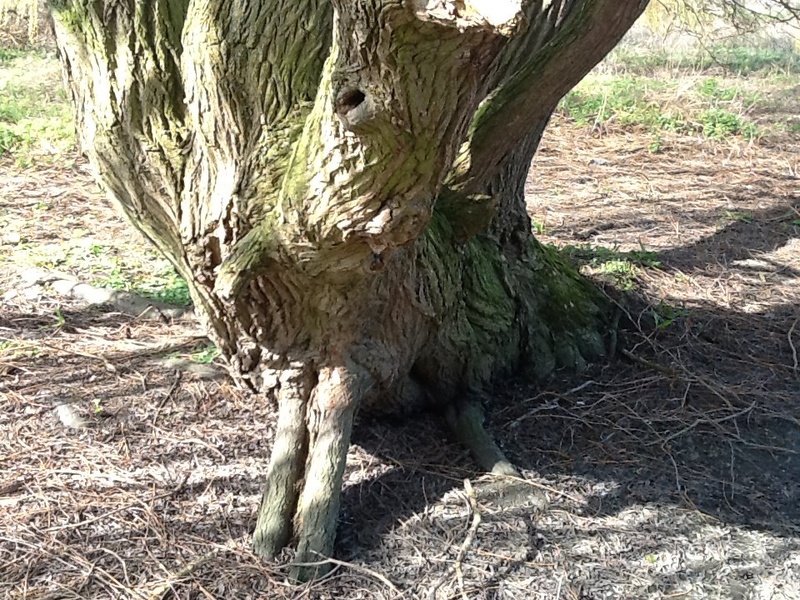 The ‘finegan’ wake after death – a way out of death? In this light, I again wonder how anyone has not noticed — except me? 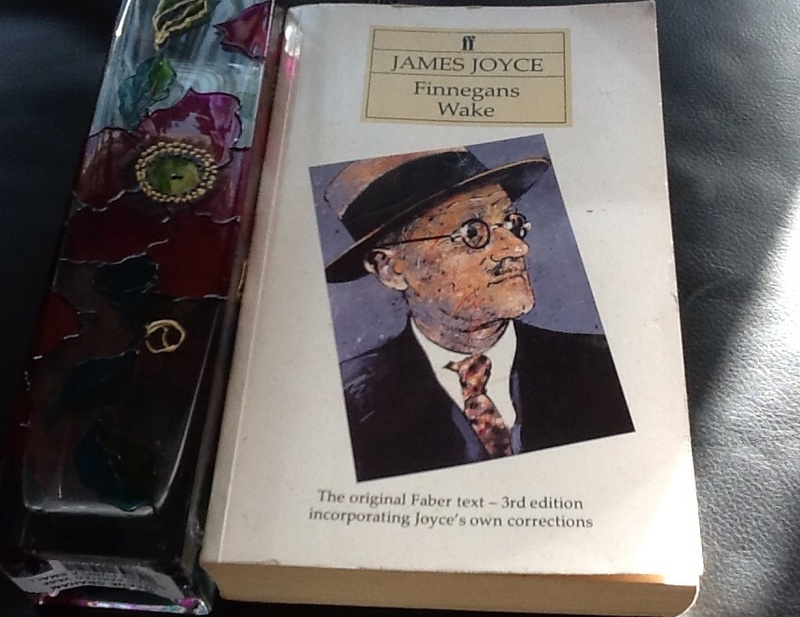 (please tell me here in reply to this comment if I am wrong about being the first to notice) — that Finnegan as a word is a blend of Finish and Began, and this also ties in with what appears to be generally accepted, i.e. that the Finish of this massive book runs into the ‘riverrun’ of where it Began! Null null Immortalis, or weird weird, one cancelling out the other. The ending never ending by its start?